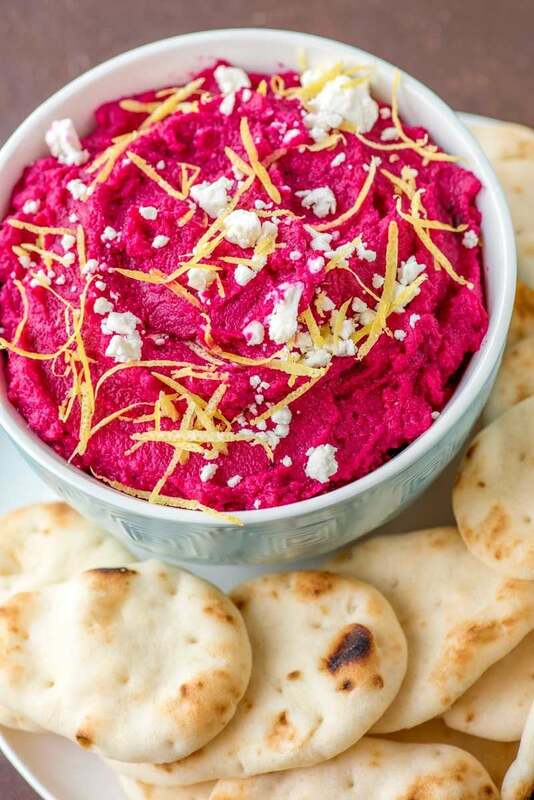 This feta, lemon, and roasted beet hummus is not only tasty (and vibrantly festive!) but it's also a good choice for a healthier lifestyle. 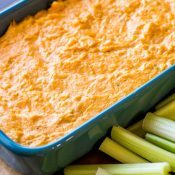 Packed with the benefits of chickpeas and beats, this dip is a guilt-free choice for a quick snack or entertaining guests! And between you and me, I was surprised by just how much I enjoyed this recipe. I’ve always liked beets, but they don’t appear in my diet as much as they probably should. Sometimes I feel like I’d need more hours in the day to fully appreciate all the foods I like. Although now that I’ve discovered this hummus, I can see myself making more time for beets in the future! Plus, beets are in their prime season in the summer and early fall, making this a perfect snack to serve at BBQ’s or while you’re inside and watching the leaves change. 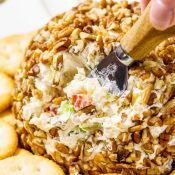 I also love how versatile this dip can be. Spice it up by serving different snack foods to dip with it! 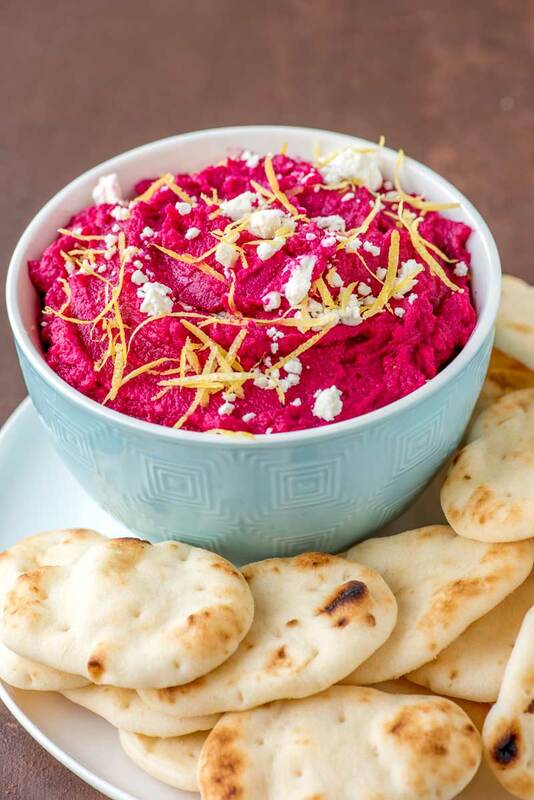 I can personally attest that this beet dip goes great classic tortilla chips, slices of veggies, or even pita bread. I was lucky enough to find the pictured pita bread in my grocery store’s bakery department, but you could easily use your favorite pita bread recipe and either make it in small batches or cut it into squares. When it comes to the nutritional value of hummus, you need to look no further than the chickpeas. Chickpeas (also called garbanzo beans) are round, cream-colored legumes. They’re a popular food around the globe, from Africa to Asia to all over the US – and for good reason. Chickpeas are a fantastic way to get a dose of proteins, fiber, carbs, and a long set of vitamins and minerals into your diet. Overall, hummus can be considered high in fat, but it’s the mostly unsaturated fat that’s very heart-healthy. 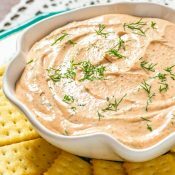 I know I usually feature a lot of indulgent dips on this little food blog, but this hummus is actually good for you to eat. Not only do the chickpeas bring stellar health benefits, but beets are high in immune-boosting vitamin C, fiber, and essential minerals like potassium (which can be difficult to maintain in your diet) and manganese (which is great for your bones and many vital organs). If you’d like to know more about any beets are great for you, check out this list of 11 Amazing Benefits of Beets. Tahini is a staple in most traditional hummus recipes, and it certainly adds it’s own flavor. Tahini is ground down sesame seed (so in other words, a seed butter) and many recipes will use any other available nut butter. However, in the case of this recipe, tahini and nut butter are omitted entirely in favor of feta cheese and an extra dose of lemon. It’s not the same as using tahini, but this roasted beet dip is meant to have a more refreshing, summery taste. How long do you roast beets? 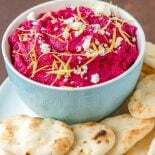 There are many methods for roasting beets, but for this hummus, I like to roast them at a high oven temperature (425 degrees F) for about 45-60 minutes. This will make the beets nice and soft for blending. As most hummus recipes, this one uses chickpeas for its base. If you’re not a fan of chickpeas, check out these substitutes. If you’re looking for other healthy and party friendly snacks, check out Crispy Garlic Parmesan Edamame! Preheat oven to 425 degrees F. Lightly spray a small baking dish (any dish large enough to hold the beets will do) with cooking spray. Once beets are cooled, gently remove skins from beets and then cut beets in half. 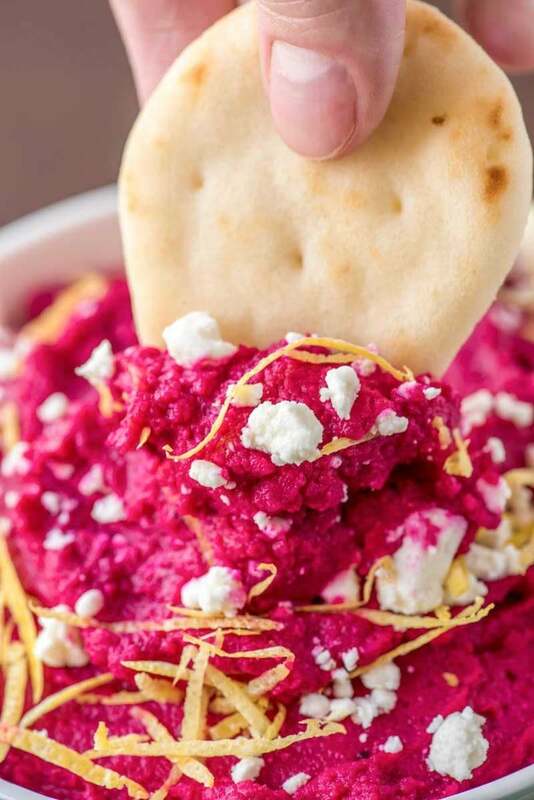 Using a food processor, blend the chickpeas, cooked beets, feta cheese, garlic, 2 tablespoons olive oil, lemon zest, lemon juice, cayenne pepper, salt, and pepper together until desired consistency is reached. (TIP: blending less will give the dip more of a "crunch" from the chickpeas). As you blend, stop the processor periodically and scrape the sides, then blend again. Serve dip immediately with chips, assorted veggies, or pita bread for dipping. Surely that’s 1/2 *pound* beetroot, rather than 1/2 *cup* ??? Hey Kaye! I checked my recipe notes again, and it should only be about 1/2 cup, maybe 3/4 cup max. The above video shows the correct amount to use as well. Lovely recipe Chrisy! That colour is amazing, and I love that you swapped out the tahini for feta! I LOVE the vibrant color of this dip…it would make any buffet table so much prettier! 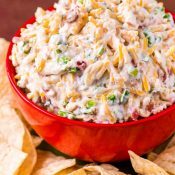 Hi Christy, how long can this dip be stored in the fridge for? I can’t wait to try this recipe out.